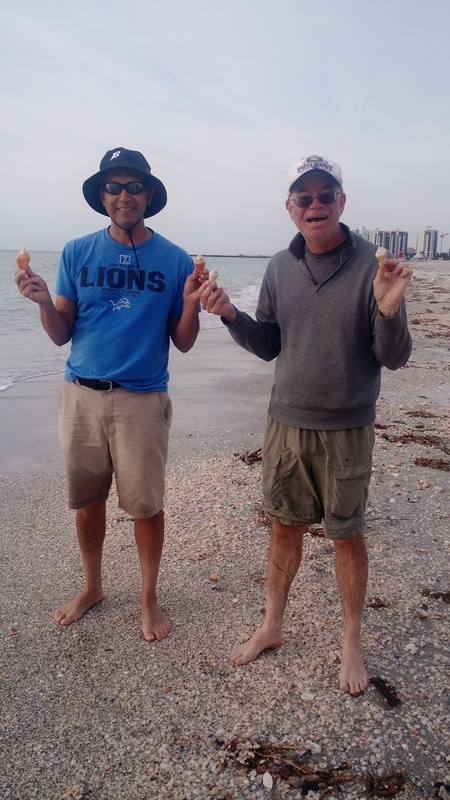 RVentures with Doug and Chris: The Tampa Area: Lions and Tigers and Alligators, Oh, My! 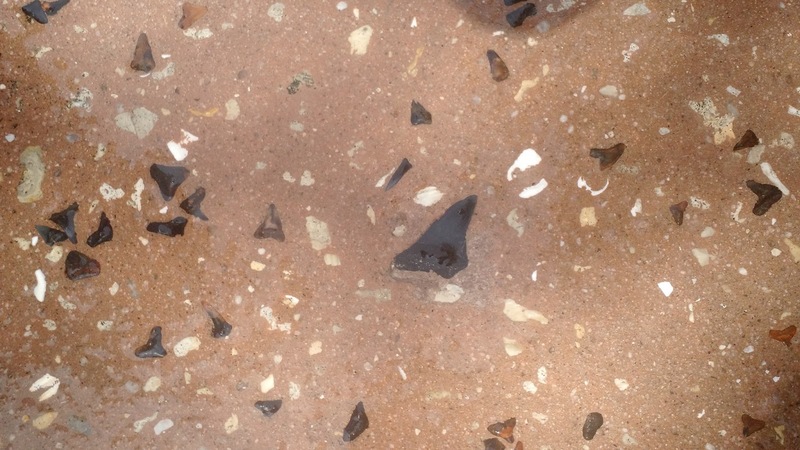 The Tampa Area: Lions and Tigers and Alligators, Oh, My! Lions and Tigers and Alligators, Oh My! The lion sighting came in the form of a Detroit Lions T-shirt worn by Dave as he and Doug searched for sea shells on the many beautiful beaches in the area. 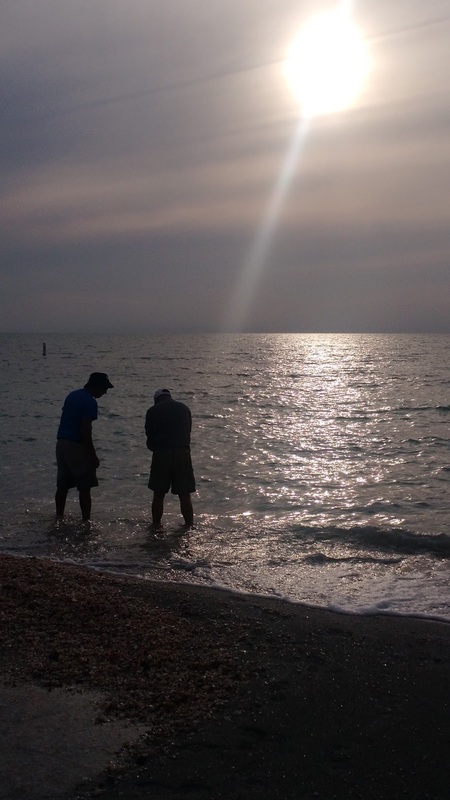 Growing up on the shores of Lake Michigan, Dave is drawn not only to anything that has to do with Michigan sports but also anything to do with beaches. In all we had the chance to enjoy six different beaches ... each with its own unique beauty. 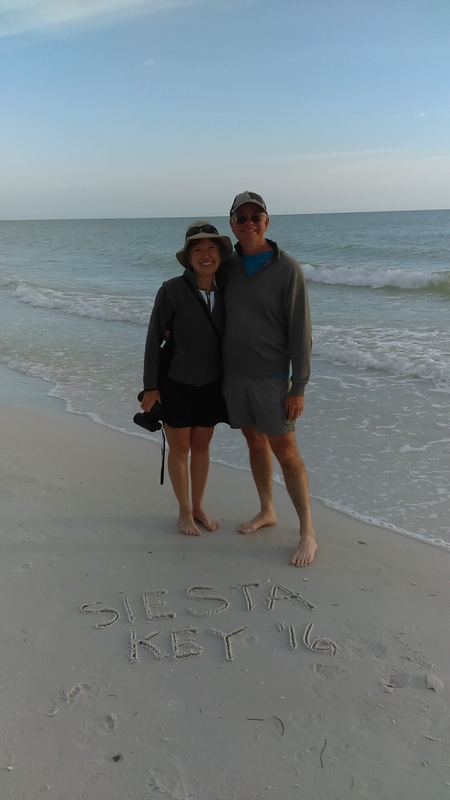 Siesta Key beach has been rated as the #1 beach in the USA, and we did love its fine white sand ... although I am getting tired of continuing to find that fine white sand in our clothes and RV! 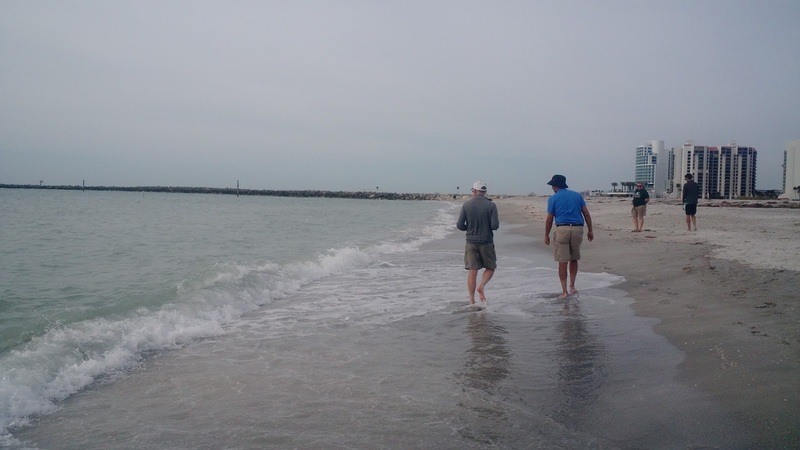 Clearwater beach, rated #2, has a bustle of activity along the shore as well as on Pier 60. .... and great people watching moments! Across the bay from Clearwater beach, we found the more sedate Sand Key Park beach. 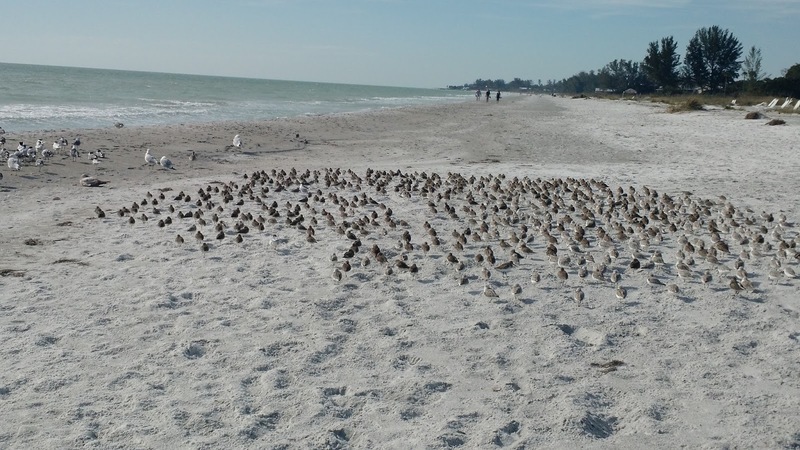 Easy parking, fewer people, great sea shells and beautiful sunsets made it a nice stop after busy Clearwater. Lido Beach gave us our best walking surface for our four mile stroll along the shore ... and a life-saving snack shop halfway back! The easy parking and nice beach and park surrounded by beautiful homes and an interesting town square made it my favorite! 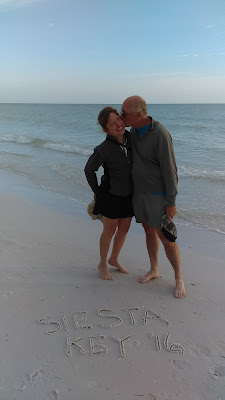 We found Caspersen Beach at the end of the Legacy and Venetian Bike trails. 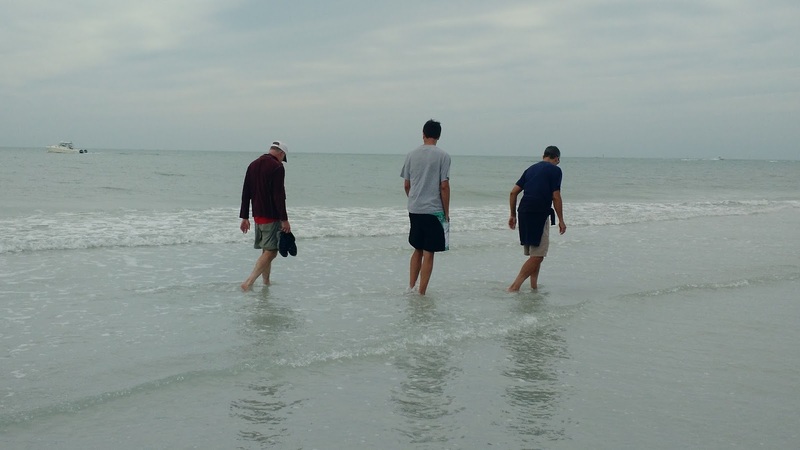 We only had time for a short walk but were intrigued with all the people searching not for seashells, but for shark teeth! 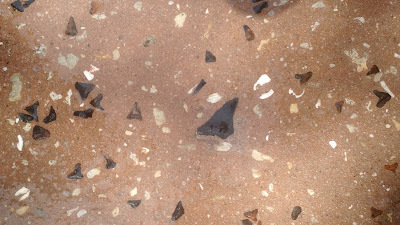 The path leading to the beach had some of the black teeth encased in it. Longboat Key beach was an "out of the way" stop that gave us another two miles of beautiful beach walking as well as a chance to converge on a massive bird gathering along the shore. 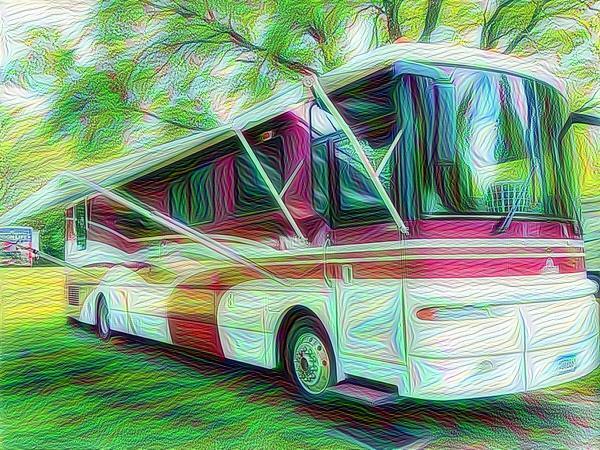 Our Tiger was spotted when we took a day trip to Lakeland, Florida. Being Michigan natives, Doug and Dave were drawn to see the Detroit Tigers spring training game at Joker Marchant Stadium in Lakeland. The chance to enjoy a day in the sun watching baseball in early March would have any Northerner excited, and their enthusiasm is easily rubbed off on us! 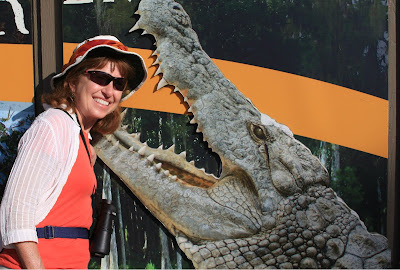 And the Alligators, Oh My! After the game, we checked out Circle B Bar Reserve in Lakeland to find our third wild animal ... the Florida alligator lurking close to our walking path. The two mile hike on the shores of Lake Hancock gave us a chance to "reach out and almost touch" a number of wild gators. The cardinal seems to be enjoying a warm Florida winter better than a cool Minnesota winter! 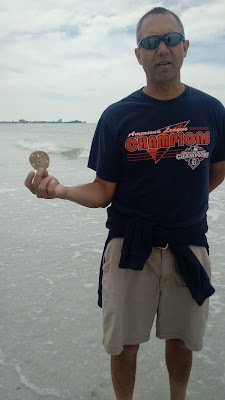 ... which is always good when you are visiting Florida and all you find are Sand Dollars! The University of Michigan football team is spending their spring break practicing at IMG Sports Academy in Bradenton, Florida, so we joined thousands of other die hard Michigan fans for an open practice experience. 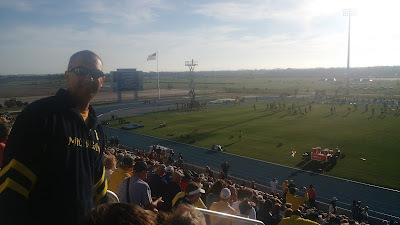 Just walking around the campus of this sport-oriented grade and high school was an experience in itself ... only to be outdone by the experience of trying to get in and out of the complex with the gazillion other Michigan fans! 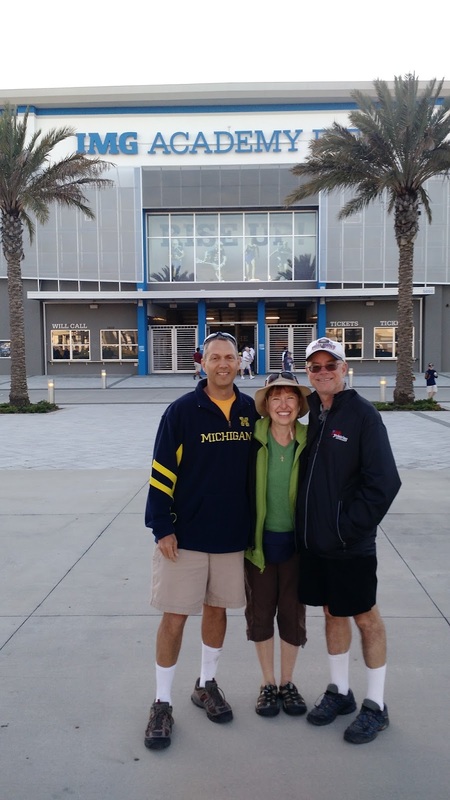 Dave does love his Lions, Tigers, and Wolverines, and we enjoyed all of our "wild life" moments with our friends, Dave, Maureen and Nick! Until next time ... seek out some wild life around you ... and enjoy the adventures in your life!